The Captain is headed for shore; after that it's up to you to find your riches! Click here to play! There is plenty of treasure hidden in secret caves, so prepare yourself for the adventure of a lifetime! 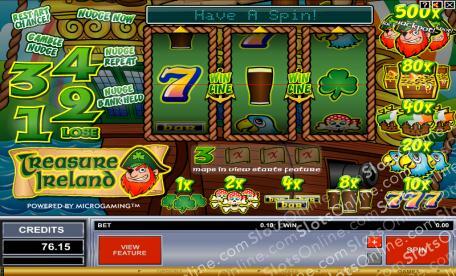 Treasure Ireland is an enticing 3-reel slot played across a single pay line. This classic game offers a massive jackpot for the correct combinations, so find the Captain for some special winnings. Instead of Wilds and Scatters, Treasure Ireland gives players the chance to Nudge and Hold their reels after certain winning combinations. This allows you to make your own combos for cash payouts! There is also a special Bonus Round that can be activated when three Map symbols appear on the reels. Treasure Ireland is the place to be for pure luck and huge jackpots, so catch those lucky clovers and start winning at Treasure Ireland today! When three Map symbols appear on the reels the lucrative Bonus Game will be triggered where you can make some huge winnings.